feeding whale shark in it's natural habitat, Sodwana Bay in Kwazulu Natal South Africa. Maya and her class have been studying "Conservation Helps Preserve Threatened Species" as their unit of enquiry and this has brought up a discussion about the proposed captivity of a whale shark in the soon to open Resorts World at Sentosa. Maya and her friends made a speech at the Chatsworth Film Festival about their concerns and why they thought it cruel to keep a whale shark in captivity. I was very impressed with these 9 year olds' initiative and confidence in getting up in front of so many people to express themselves. Maya does feel strongly about this issue and last weekend she wrote a petition on our Ikea whiteboard and left it outside our gate for passers-by to sign. Some people did, most hurried by without taking a second look, which deeply disappointed Maya. This is the first sign of any activism and concern for the world around us although Maya has always loved animals, and I love that she is interested and aware of issues that are broader than her small world. She has started feeling uneasy about eating meat (she turned her nose up at roast duck on mother's Day), so I'm sure it wont be long before she announces she is vegetarian. We have vegetarian friends and she came home the other day saying she enjoyed the wrap she had for lunch that had nothing but salad in it. From a girl who would eat nothing that looked remotely green (broccoli is still a struggle) this is a breakthrough I heartily approve of! 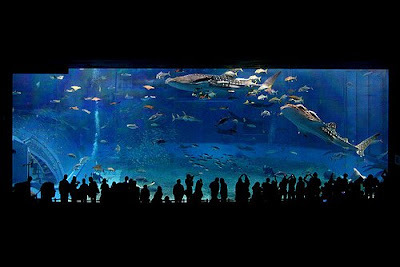 Anyway, if you don't already know, Resorts World at Sentosa are planning the Quest Marine Life Park, an oceanarium spanning 8 hectares with the largest single marine tank in the world, which will include a 6.5 million gallon Whale Shark Lagoon. Whale Sharks are the largest fish in the ocean, reaching lengths of 40 feet (12 meters) or more, and can live for up to 70 years. These gentle, docile creatures feed purely on plankton and are known to migrate every spring to the continental shelf of the central west coast of Australia. They awe scuba divers and snorkelers in the tropical waters around such places as Thailand and The Philippines by hanging around for hours and sometimes and even allowing divers to hitch a lift. They are a threatened species, but are still hunted in parts of Asia, such as Taiwan and the Philippines. I have joined the Facebook group "Say NO to Whale Sharks in Captivity", and as they succinctly put it: "We believe it is cruel to keep whale sharks in captivity. The whale shark is a highly intelligent and sociable animal, has a migratory range of 13,000 km and can dive to 980 metres. Is it possible for any man made environment to cater to their requirements?...Recently “Ralph”, one of the whale sharks at the Georgia Aquarium Atlanta, died. ‘Norton’ another whale shark died five months later, proving that whale sharks are not meant for confinement to glass walls." If you feel it is unnecessary and cruel to keep whale sharks in captivity, join the facebook group. This Saturday 16th May, is the 2nd Singapore Animal Welfare Symposium, co-organised and hosted by NUS Student’s Animal Welfare Group and Animal Concerns Research and Education Society (ACRES). Open to all, the Symposium is a platform for members of the public of all ages, as well as animal-related organisations, to discuss issues affecting domestic and wild animals and those exploited on an industrial scale and come up with effective ways to end animal suffering. There will be lots of lively discussion about animal welfare and such topics as pet abandonment, the welfare of animals in captivity at the Singapore Zoo as well as the Resorts World at Sentosa whale sharks debate will be raised. I quote from the blurb on Facebook: "Attendance at the Symposium can be your first step on the rewarding path to becoming an advocate for animals or, for those already involved in the animal welfare movement, the Symposium is a wonderful opportunity to meet with like-minded people, chat to local animal welfare experts and learn how you can do even more to help our furred, feathered and scaled friends!" Date: Saturday 16th May 2009. 21 Lower Kent Ridge Road. There is also an on-line petition you can sign. My husband and I were fortunate enough to swim with these most beautiful, peaceful creatures over Easter in Donsol, in The Philippines. They are so gentle and to put it simply - they are HUGE! The smallest one we swam alongside was about 3 metres long, and the others probably averaged 5 metres. Step out 5 metres in your home - then imagine something of that size in a tank... There are places in the world, like Donsol, that are reasonably accessable where people are fortunate to have the opportunity to experience the beauty and peacefulness of the Butanding, whale sharks, in their own, natural habitat. Let's send people to these places as eco-tourists instead. Hi Cathy. It must have been amazing swimming with these wonderful creatures. I'm sure it's an experience that stays with you forever. 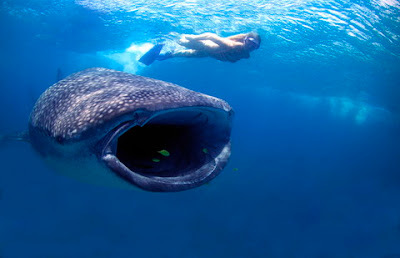 Lets appreciate the beauty of the whale shark in the wild.